1/0 suicide style hook and small running ball sinker. The running sinker offers little to no resistance to the fish. Bream will often ‘pull ‘at the bait. 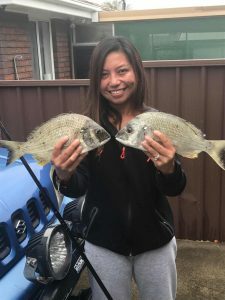 Don’t strike straight away, give the bream a little line, either use a bait runner feature reel or open the bail arm of the reel or dip your rod. 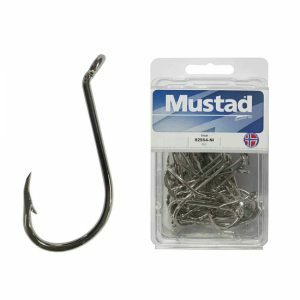 This will give the fish a better chance of taking the bait fully and you a greater chance of a hook-up. It is rather common for bream to swallow the bait. It is not recommended to use circle hooks in this example. Although they limit gut hook-up’s they are more effective with the rod in a set position. Bereyling, this is key to attracting and holding the fish in one place. You can simply see if the berley is working when you clean the fish the berley will be in the fish’s gut. It is recommended that you berley either in the early morning or into the night, during the day will tend to attract fish picker fish. Chicken pellets soaked in salt water work well. Make a handful into a ball and toss out with every cast, be sure to judge the way the water is running and throw according. For example, incoming tide your bait will move to the left, hence throw right and the berley will work its way down with the drift. Making the berley into a ball will allow it to sink a few feet before dispersing. Line, I prefer mono. line in this environment 12-15lb. Bream are a scavenger fish and for the most part will take a wide variety of baits. Although, in different environments will favour a few particular types. For the Breakwall I have found prawns and fish baits, such as pilchard to be the most favoured. 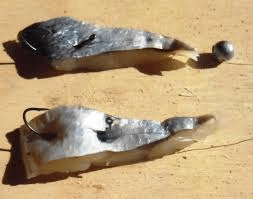 When using fish baits always be mindful of best method for baiting is to thread the bait up the shank of the hook leaving the barb and point fully exposed, this will increase your hook up rate. Bream, as most fish, are more active at sunrise and sunset. As a general rule approaching a high tide at these times is favourable. Night feed into the night and ‘cover’ in the form of darkness or overcast conditions are in the angler’s favour. 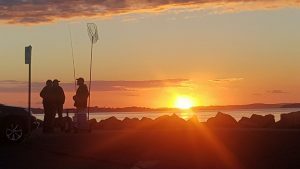 PreviousPrevious post:Pipi Baits – TIPNextNext post:Port Stephens -5 Top School Holiday Fishing Spots.